What exactly is guest blogging and why should you care? Don’t confuse guest blogging with posting comments on blogs. Posting comments is good to establish your authority in your field. 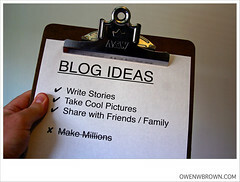 It’s also a good way to create a relationship with blog owners in your niche. Guest blogging is when you actually write a blog post specifically for a blog that owned by someone else. This post is an example of a guest blog post. Goal-setting seems to be a hot topic right now, especially at the beginning of the year. Recently I posted a blog about choosing heart’s desires goals versus realistic goals and received over 100 responses on LinkedIn regarding that subject. I’ve written before about Energy Profiling. It helps you determine your beauty style by your personality and behavioral nature and it’s amazing how accurate the types are. Once I started dressing in the colors and styles true to my type, I started feeling better about who I was, and more confident about myself and my work. The transformation took me to a whole new level. This past month I experienced another transformation that took me to a new level again. 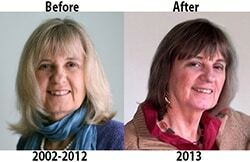 That was when I took the advice of the image consultant, Carol Tuttle of Dressing Your Truth, and went back to my original hair-color and got a new hairstyle. It was scary, especially when my hairdresser colored my hair much darker than intended. The members of the International Association of Professional Life Coaches™ (IAPLC) present Masterclasses twice a month to its members and we’ve decided to open them up to the public on a live-only basis. That means you can attend the classes live if you’re not a member. Only IAPLC members get access to the recordings. These masterclasses teach life coaches various business skills so they can run profitable coaching businesses. And if you are a life coach and want access to all the masterclass recordings , you can become a member here. The next masterclass, “Get More Coaching Clients: The 7-Step Client-Attraction Formula” by E.G. Sebastian, will be Jan. 23rd, 4-5pm EST. In this content packed webinar you’ll learn to do all of the above and more. You’ll learn about a 7-Step process that you’ll be able to implement over and over again to grow a tribe of 1000s of true followers, develop a relationship with the people in your “tribe,” and learn how to effortlessly generate an income when you have the right puzzle pieces in place. Learn to market your coaching like a pro & make 2013 your most profitable year ever! Join E.G. Sebastian as he presents effective ways to attract potential coaching prospects and find out how to develop a relationship with your prospects, convert prospects into paying clients, & keep them as life-long customers. Try this: cover your mouth and talk. That’s what most marketing sounds like. Chatter. Noise pollution. Combine that with the competition – all those emails, ezines, audios, haranguing us from all directions. More chatter. Louder, but not better, noise. Does it frequently feel that despite your meaningful message and mission, your productive services, all those trainings you’ve invested in, your generosity of spirit and passion for your business, few hear you or really see you? Are your messages perceived as marketing chatter? Maybe your client funnel is a trickle. Perhaps you’re working too hard for too little money. Or your results are mediocre. You feel frustrated and maybe even burnt out. Sometimes you even look at monster.com — just in case. Should Goals Be Realistic Or Your Heart’s Desire? The New Year is coming up and we’re supposed to be setting goals…30-day goals; 90-day goals; one-year goals. But as I ponder what I want to write down for my goals some questions arise that I can’t answer. 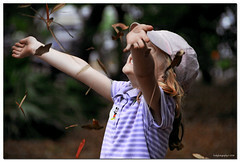 One of the biggest challenges of professional life coaches is lack of self-confidence. Self-confidence is something that ultimately can only come with experience and even then it can sometimes falter. Of course it’s to be expected when you’re just starting out, but I have talked with many seasoned coaches who are still struggling with self-confidence. Besides experience, there are other things you can do to gain more self-confidence and one way is understand your nature and energy movement and then learn how to express that as well as your natural beauty in how you dress yourself. Recently, I came across a brilliant system for this while researching resources for my clients. It’s called Energy Profiling developed by Carol Tuttle, and it deals with aspects of your personality in relationship to the flow of nature. The system divides us into 4 types and shows how our energy flows in basically 4 different ways. The 4 types are also connected to the 4 elements of air, water, fire, and earth, as well as 4 natural elements, hydrogen, carbon, nitrogen, and oxygen. 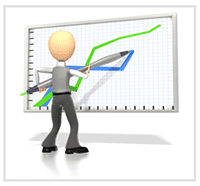 Do you have a marketing plan in place for 2013? 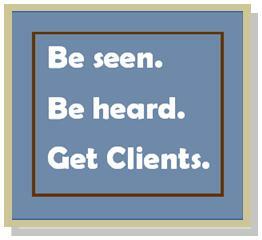 Do you have a marketing plan in place for 2013? Do you know what forms of marketing you will be activating next year? Have you scheduled your launches and joint venture promotions? Have you lined up the topics for your teleclasses, blog posts, and newsletters? Have you set firm income goals for 2013? Well, if not, you’re not alone. Most entrepreneurs don’t do this kind of planning ahead of time, and most entrepreneurs also don’t stay in business very long either. That’s why the International Association of Professional Life Coaches™, has taken up the task of supporting your life coaching needs with a virtual 2-hr workshop on Dec. 4th, that will help you plan out all of these things for 2013. It happened again—maybe there’s something to this! It happened again. I spent money on something I really wanted even though I was nervous about the expense and I received unexpected money afterwards. 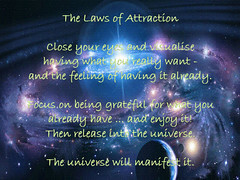 This has been happening ever since I started practicing the principles from the Laws of Attraction. They are really about trusting the Universe/Source/God to give you what you need, understanding how money flows, and your attitude. Do you tend to cringe when you spend money? I did. Before my study of the Laws of Attraction, I would deliberate on an expenditure, then feel bad after I purchased it, especially if it was for myself. Then I would worry if I made the right decision and how I was going to justify and pay for the expense. Going shopping was a painful experience, a struggle of emotions, and my attitude really took the fun out of it. I had some resistance to attending my coach’s live event this month. I guess it was a combination of not wanting to spend any more money on traveling and not wanting to spend any more money on the business until I made some more money. Can you relate to how we make so many decisions based on money (or lack of money issues)? In the end I knew I had to go, so I did. Actions taken in that knowing area are always the right ones and this one proved to be true for me because attending Heather Dominick’s SOAR was a life changing experience for me. Let me share with you how.